Microsoft and Epic plead, "Come play with us, Sony. 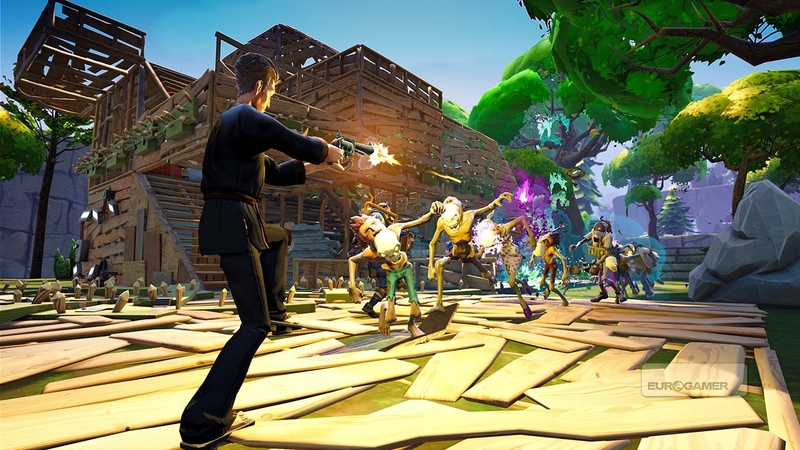 Forever and ever..."
Epic Games wants everyone who loves Fortnite Battle Royale to pop each others' heads off, regardless of what device they're playing on. It's a very utopian wish for a game that's ultimately about hordes of people hunting each other down. It's also not likely to come true in the near future, as the PlayStation 4 is the single broken strand that prevents every iteration of Fortnite Battle Royale from connecting with each other. Sony's probably not too keen on holding hands with Microsoft, which will boast cross-platform play (minus PlayStation 4) for Battle Royale soon. Currently, Battle Royale's compatibility chart is kind of V-shaped. On one arm, the upcoming mobile version of the game supports cross-play with the PlayStation 4, Xbox One, PC, and Mac (Android cross-play is coming soon; you can sign up to try out the mobile game for yourself). On the other arm, the Xbox One version of the game supports cross-play with PC, Mac, iOS, and Android (soon). The kicker is, Battle Royale console cross-play is ready to go at a moment's notice. There was an "error" last year wherein Xbox One and PlayStation 4 players were able to play against each other for a couple of hours. For a brief flash in time, Battle Royale players felt the joy of a child whose divorced parents were genuinely jolly with one another for the duration of their birthday party. Sony's refusal to enable PS4 cross-play makes for the kind of console exclusive nobody wants. Then, like all warm dreams, it popped. The chill of reality rushed in, and there's been no indication Sony intends to lift its restrictions against cross-play. People are baffled with the decision, which Sony says it enforces for security and safety reasons. Epic Games praised Microsoft's willingness to go cross-platform with consoles in a notice about Battle Royale's cross-play options for Xbox One. "Contrary to what may have been implied, Microsoft has long been a leading voice in supporting cross-platform play, connecting players across PC, mobile and all consoles," it states. It's a subtle jab, but it's there: "Microsoft wants to play ball. The other guys, not so much." Maybe 2018 will be the year Sony loosens up a smidge. If you're currently trying to complete the weekly challenge, you might want to look at our Fortnite Ice Cream Truck Locations guide. Tagged with Battle Royale,	Epic Games,	Microsoft,	News,	PlayStation 4,	Sony Computer Entertainment,	Xbox One.